Aliasing means there are multiple aliases to a location that can be updated, and these aliases have different types. In the following example, a and b are two variable names that have two different types A and B. B extends A. In memory, they both refer to the same location. 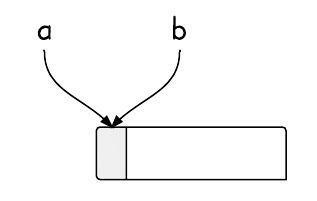 The pointed memory location are pointed by both a and b. During run-time, the actual object stored determines which method to call. How does Java handle aliasing problem? If you copy this code to your eclipse, there will be no compilation errors. The reason is that Java handles aliasing during run-time. During run-time, it knows that the first element should be a B object, instead of A.
It’s easier to see what is happening if you examine the underlying class. Notice that while ‘a’ was declared as A, the assignment “a = b” changes the type of ‘a’ to B.